Hi friend! Happy Tuesday. Today is the day that myself and a group of absolutely amazing wellness warriors start our Reset Yourself Nutrition Challenge. It’s going to be a great way to kick off the new year… I always seem to feel like the year starts in the fall and I love undertaking new habits after the magic of summer fades into memory. I also tend to need a bit of a nutrition reset after a summer of snacks and adult beverages 😉 If you want to join us I’m going to leave the registration open until midnight CST, after which time you’re going to have to wait until next time to take part in the fun! Anyhoo, today’s recipe came about when I was trying to come up with a creative way to use some leftovers. I’m teaching myself how to budget (it’s a SLOW process…) and one of the things I’m doing is buying whole fish and roasting them, like you would a chicken except it takes a fraction of the time. You save lots of money when you buy the fish whole and you can use the inedible bits to make a delicious fish stock for chowders. Win-win! So once I’d eaten the fish for dinner I wanted to find a more exciting way to use the bits that were leftover. 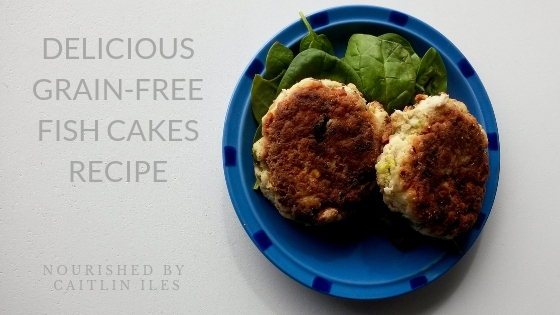 My sister had been talking to me about fish cakes earlier in the day so I thought… let’s see what can happen! And these babies were born. Coating the outside in tapioca starch gives them a nice crispy exterior while the inside is soft and flavourful. They also reheat really well if you toast them in a frying pan. If you find they’re still feeling a little soft and not forming as well as you’d like add some extra coconut flour. Start with an extra tablespoon and work you way up from there. These make great snacks or the main protein source in your meal. Because you’re using coconut and tapioca flour they’re completely gluten- and grain-free, so they’re easier on your digestive system and much less likely to cause inflammation. You want to make sure the majority of your diet is anti-inflammatory and filled with blood sugar stabilizing foods. The coconut flour adds some great fibre, the fish and egg white are great sources of healthy protein, and the egg yolk provides healthy fat and nutrients, making these little bundles the complete package. Serve with a fresh salad and you’ll tick all your nutrient boxes! This paleo-friendly recipe is easy to put together and packed with flavour and nutrition. Feel free to customize it with your own herb and spice blends. n a bowl, combine fish, egg, mustard, green onion, spices, coconut and tapioca flours, and sea salt using your hands until all ingredients are combined. Let sit for 5 minutes so that coconut flour can absorb the moisture. Roll mixture into a ball and press flat into a small patty shape. Place tapioca starch on a small plate and coat cake. Place cakes in oil and cook until browned, roughly 5 minutes, then flip and do the same on the other side. Remove from oil and place on a cooling rack to cool. Serve with avocado, Avocado Ginger Lime Dressing, or my Tahini Yogurt Dipping Sauce. Well friend, that’s my new recipe for this week. I hope you enjoy it. And remember, if you need any extra support to help start 2019 feeling strong and healthy, make sure you download my FREE Anti-Inflammatory Meal Plan & Shopping List right here!